Sadako vs. Kayako (貞子 vs. 伽椰子) is a 2016 Japanese supernatural horror film directed by Kōji Shiraishi. It is a crossover of the Ju-on and the Ring series. The film was first teased as an April Fools' joke on April 1, 2015, but was later confirmed on December 10, 2015, to be a real production. It was released on June 18, 2016, in Japan, with a North American release on January 26, 2017, on streaming site Shudder. A social worker visits the residence of an elderly woman, only to find her strangled by an electric cord. A nearby video player suddenly turns on and begins playing the infamous cursed videotape. As the social worker watches, Sadako Yamamura manifests behind her. The social worker is eventually killed with a knife slitting her throat. The video player is later sold at a shop and eventually bought by university students Yuri Kurahashi and Natsumi Ueno, who want to use it to burn a copy of Natsumi's parents' wedding tape onto a DVD. When they find the cursed videotape inside the player, a curious Yuri plays. The footage has upgraded, displaying a decrepit building instead of the usual well, and the curse deadline being reduced to 2 days. Yuri gets distracted by her phone, leaving Natsumi to watch the tape in its entirety by herself. After finishing the tape, they receive a disturbing phone call as Sadako manifests in the room behind Yuri, freaking Natsumi out. Meanwhile, a part-time worker of the shop Yuri and Natsumi went to informs the owners that she had watched the cursed videotape to which both of them react worried. She suddenly goes to the upper level of the shop and leaps to her death. The girls decide to return the video player to the shop, and the owners tell them about the recent deaths related to the cursed videotape. Desperate, the girls go to Morishige, their professor and an author on urban legends. Obsessed with the idea of meeting Sadako, Morishige eagerly watches the cursed videotape, although the girls are less than thrilled, as Natsumi only has one day to live. Morishige takes the girls to an exorcist in the hopes that she can save Natsumi. However, Sadako possesses Natsumi and forces the two assistants to kill themselves, before the exorcist begins to boil from the inside and kills Morishige for interfering. In her dying breath, the exorcist tells the girls that a man with psychic powers, Keizo Tokiwa, is on his way to help them. When a despondent Natsumi blames Yuri for her situation, Yuri watches the tape, hoping that this will pass the curse on to her and Natsumi will be spared. However, Keizo arrives, accompanied by a blind psychic girl, Tamao, who tells Yuri that she has just unnecessarily cursed herself. The only way to permanently expunge the curse is to pit Sadako against another vengeful spirit so both obliterate each other. As Yuri hears that Natsumi has uploaded the cursed tape onto the Internet, Natsumi tries to commit suicide to escape her imminent death. Whilst Yuri rushes to save Natsumi, Sadako appears before Natsumi and kills her via hanging. Keizo and Tamao target Kayako Saeki to be the rival spirit. Meanwhile, high school student Suzuka Takagi starts having dreams of the haunted Saeki house after moving in nearby with her family. She later runs into Keizo and Tamao, who states that the house beckons to Suzuka. Keizo warns her not to enter or she will be killed. After Suzuka leaves, a group of bullies arrive and force a schoolboy to enter the Saeki house. However, Kayako and Toshio violently drag all of them to their demise, including the schoolboy and the group leader who gets killed by having his head snapped off by Toshio. That night, Suzuka thinks she sees one of the kids inside the Saeki house and goes inside herself. She sees Toshio and her screams prompted her parents to rush in, but Toshio kills her father by snapping his head off and Kayako kills her mother. Keizo arrives in time to save Suzuka, although she is already cursed. Yuri and Suzuka agree to team up for Keizo's plan, where they enter the Saeki house so that Suzuka can watch the cursed videotape inside and Yuri can see Kayako, thus becoming afflicted with both curses. Keizo hopes this will make Sadako and Kayako fight over the girls and obliterate each other in the process. As the plan unfolds, Toshio appears before them, but Sadako drags him inside the TV with her hair as Toshio screams. Suddenly Sadako begins to crawl out of the TV whilst Kayako crawls downstairs, prompting them to brutally confront each other. At first both spirits seem to overpower the other but ultimately the bout ends in a stalemate. Keizo orders Yuri and Suzuka to flee, upon realizing that his plan failed. Keizo reveals his last resort: one of the girls has to lure both ghosts into the well so they can be sealed inside. Yuri chooses to sacrifice herself, jumping into the well as Sadako and Kayako begin to rush towards her, resulting in a massive collision that instantly bisects Keizo and forms a contorting mass of flesh, hair and eyes. The mass falls into the well presumably crushing Yuri to death. Suzuka seals the well and seemingly imprisons the mass for good. This last resort does not work either: both Sadako and Kayako's curses have combined, and become a single entity – Sadakaya. Sadakaya, possessing Yuri's body, has the appearance of Sadako and emits Kayako's death rattle. Suzuka helplessly screams in Sadakaya's presence whilst Tamao's psychic powers get overwhelmed. Toshio appears behind them, taunting their fates, which are ultimately left unknown. In a post-credits scene, the modified version of the cursed videotape is shown. At the entrance of the building, Sadakaya menancingly contorts her body, imitating the bodily movements of both Sadako and Kayako. Sadakaya suddenly teleports to the screen, emitting a final death rattle. Despite a rumour about Takako Fuji reprising her role as Kayako in this crossover, the actress stated several times on Twitter that she was not playing this representation of the character. Masaki Saisho, who played Kayako in Ju-On: The Beginning of the End and Ju-On: The Final Curse, does not appear in the film either. This makes Runa Endo, the fifth actress to play Kayako (counting Aiko Horiuchi, who starred in The Grudge 3 and Anna Moon in Tales from the Grudge). As for Sadako, Elly Nanami is the seventh actress to play the role, after Rie Inō (Ring, Ring 2), Hinako Saeki (Rasen), Ayane Miura (Ring: Kanzenban), Tae Kimura (Ring: The Final Chapter, Rasen), Yukie Nakama (Ring 0: Birthday) and Ai Hashimoto (Sadako 3D) (excluding Samara Morgan's and Park Eun-Suh's incarnations from The Ring and The Ring Virus respectively). The film's theme song is "Noroi no Shananana" (呪いのシャ・ナ・ナ・ナ) by the heavy metal band Seikima-II. It was released as part of a double A-side single on June 15, 2016, which also included an English-language version of the song. A certain number of events were held for the promotion of the movie. On Twitter, users can vote for either Sadako or Kayako as their favorite horror icon. The end of the vote was scheduled for the 17th of June. Two videos, one for Sadako and one for Kayako and Toshio, were uploaded on YouTube to appeal on the voters. Sadako won. In the end of May, a press conference was held to promote the movie. As it happened before for previous Ju-on movies, Sadako, Kayako and Toshio were present, in costumes, and stayed true to their roles. In the beginning of June, a baseball match featuring the Nippon-Ham Fighters and the Yakult Swallows was interrupted by Sadako, Kayako and Toshio who staged the first pit ceremony. A couple of other videos were released at the same time, featuring the ghosts of the movie teaching theater etiquette, such as not bringing recording devices or avoiding to take minors to see the movie. Social media was also heavily used to promote the movie. A Twitter account created for Sadako (as a promotion for the Sadako 3D movie) was reused. An Instagram account was created for Kayako and Toshio, depicting humorous, everyday life situation with the two ghosts. As for the marketing part, some goodies playing on the cute aspect regularly used in Japan were released, such as cup hangers, beauty masks and even a collaboration with the Hello Kitty brand. Other goodies were more traditional, such as T-shirts, key rings and doorknob hangers. The film has received mixed reviews. John Squires of Bloody Disgusting complained that the title was deceptive saying "It’s not merely that it takes too long to get to the good stuff, it’s that the good stuff never comes at all." He further stated the film was just not interesting, writing "Feeling like a reboot of The Ring crudely smashed together with a reboot of The Grudge, the film hardly brings the two franchises together in any sort of creative fashion, and it’s all very clunky; worse yet, it’s incredibly boring." Joe Lipsett, also writing for Bloody Disgusting, agreed saying "The biggest flaw of Sadako vs. Kayako is that it takes far, far too long to get the titular to face off.....Even the narrative hoops required to bring the two franchises together doesn’t hold up under scrutiny!" More positive reviews include Chris Alexander, writing for Comingsoon.net, found the film to be "goofy but entertaining" saying "The entire thing feels like an expanded viral video stunt, a fan-flick. But as we mentioned, that doesn’t mean you won’t have a good time." Katie Rife for The A.V. 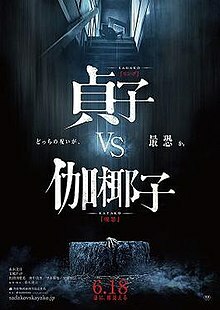 Club admitted that the "vs" in the title came up short, but said "Still, for fans of Japanese horror looking for popcorn entertainment, or for fans of Western horror looking for something different-yet-familiar, it’s worth indulging your curiosity for 98 minutes." ^ "Japan Yearly Box Office" (http://www.boxofficemojo.com/intl/japan/yearly/). Box Office Mojo. Accessed 10 August 2016. ^ "Sadako vs. Kayako Film Brings Together Ring, Ju-On Franchises". Anime News Network. Retrieved 2016-02-25. ^ "Christmas has come early..." Facebook. December 23, 2016. Retrieved December 25, 2016. ^ "č—¤č˛´ĺ? on Twitter: "@aoleos No,I'm not."". Twitter. 2016-04-29. Retrieved 2016-06-11. ^ "最所美咲 on Twitter: "@akb48755 电影导演不同。 藤贵子是第一代。 我是第3代。 现在的伽椰子是第4代。"". Twitter. Retrieved 2016-06-11. ^ "Seikima II Performs Ring/Ju-on Crossover Film's Theme Song". Anime News Network. 2016-04-06. Retrieved 2017-04-04. ^ "Sadako & Kayako want your vote for the ghost with the most | RocketNews24". En.rocketnews24.com. 2016-05-14. Retrieved 2016-06-11. ^ "映画『貞子VS伽椰子』完成記念イベント". YouTube. 2016-05-26. Retrieved 2016-06-11. ^ Bieler, Des. "Creepy first pitch features characters from 'The Ring' and 'The Grudge'". The Washington Post. Retrieved 2016-06-11. ^ By MrDisgusting on May 1, 2016 (2016-05-01). "'Sadako vs. Kayako' Promos Teach Theater Etiquette". Bloody Disgusting!. Retrieved 2016-06-11. ^ "č˛žĺ? (@sadako3d)". Twitter. 2016-06-07. Retrieved 2016-06-11. ^ "伽椰子と俊雄のほのぼの親子日記 (@kayakowithtoshio) • Instagram photos and videos". Instagram.com. Retrieved 2016-06-11. ^ "Sadako vs. Kayako Cup Hangers — White Rabbit Express". Cms.whiterabbitexpress.com. 2013-08-28. Retrieved 2016-06-11. ^ "Get Scary Good Looks With Sadako And Kayako Beauty Masks For Their Epic Horror Crossover – grape". Grapee.jp. Retrieved 2016-06-11. ^ "Hello Kitty and Friends Cosplay as Characters from "Sadako vs Kayako"". Crunchyroll.com. 2016-05-27. Retrieved 2016-06-11. ^ "映画『貞子vs伽椰子』限定グッズ！". Ckec.jp. Retrieved 2016-06-11. ^ a b Squired, John (January 25, 2017). "'Sadako vs. Kayako' is the Most Deceptive Title Since 'Jason Takes Manhattan'". Bloody Disgusting. Retrieved February 25, 2017. ^ Lipsett, John (September 20, 2016). "[TIFF Review] 'Sadako vs. Kayako' is a Disappointment". Bloody Disgusting. Retrieved February 25, 2017. ^ Alexander, Chris. "Sadako Vs. Kayako Review". Comingsoon.net. Retrieved 17 February 2019. ^ Rife, Katie (January 27, 2017). "The Ring and The Grudge collide in the teen-friendly J-horror flick Sadako Vs. Kayako". The A.V. Club. Retrieved February 25, 2017.